Whenever I'm at the grocery store I love to saunter over to the floral department to look over the lovely bouquets available. I'm always enthralled by the beauty of the blooms and different types on display. One flower in particular has always caught my eye, the gorgeous Gerbera daisy. This delightful beauty comes in a variety of colors that include white, hot pink, dark red, orange and yellow to name just a few. Another interesting fact about these flowers is that you can see other hues within the original colors, especially around the centers which can range from dark to a light yellow. If you are a bride pondering what kind of flowers to use at your wedding then you must consider the stunning Gerbera daisy. Besides the eye catching petals, these flowers also are economically pleasing and bloom throughout the year. It doesn't matter whether you're nuptials are in the summer, fall or spring, you can easily incorporate them into your event. Gerbera daisies are stunning in any season. 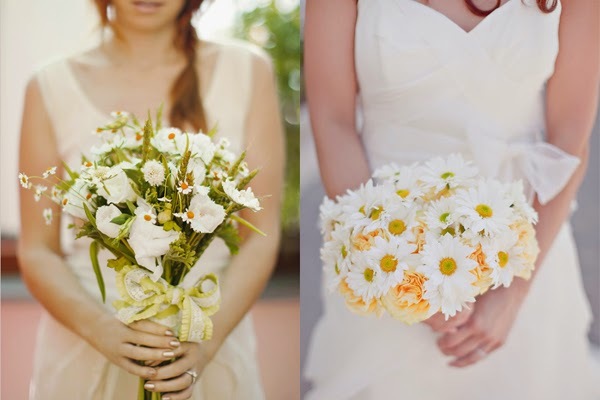 if you've decided on a fall or Halloween wedding you might opt for a bold orange or red daisy. Arrange them in crystal vases or in a bridal bouquet with other seasonal flowers such as dahlias, roses and lilies. If you are a spring bride, then a lovely pink or peach daisy arranged with other spring blooms will pop with color on your reception tables. Summer brides can blend elements of any seasonal flower with her majestic Gerbera blooms. When you are brain storming ideas for your wedding you might think about choosing favor boxes adorned with Gerbera daisies. Fill the boxes with chocolates and soaps. For an environmentally conscious bride you might add in flower seeds that your guests can later plant for some amazingly lovely flowers of their own. Glue on stickers or personalized tags printed with a lovely daisy image and your names and wedding date for a personalized touch. 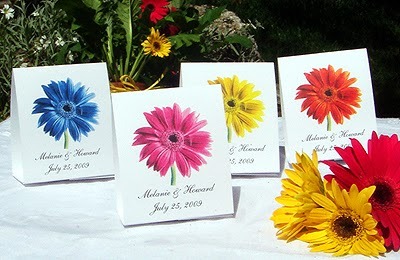 If you are searching for other types of favors for your event you might enjoy a Gerbera daisy mint tin or flower pen. 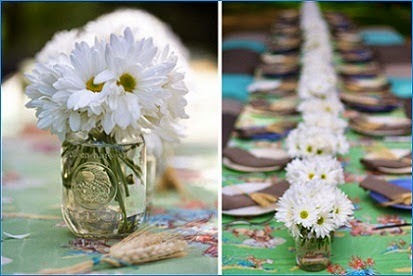 For creative brides you might whip up a lovely candle or place card holder with a daisy theme. 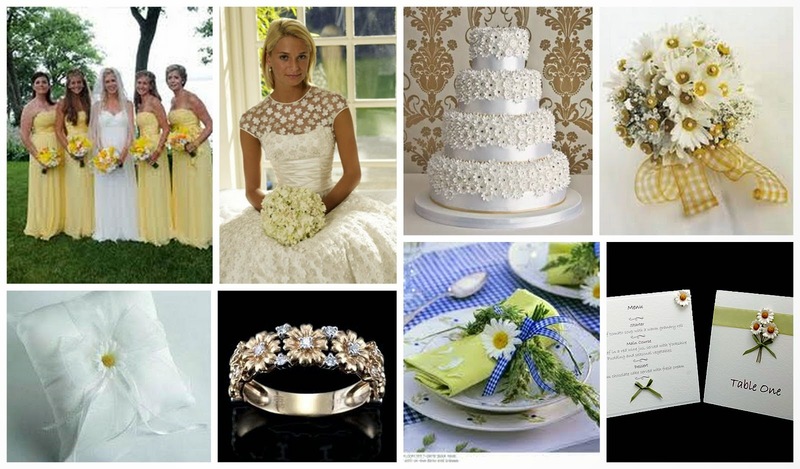 Wedding cakes today are magnificent sugary creations that awe the senses. 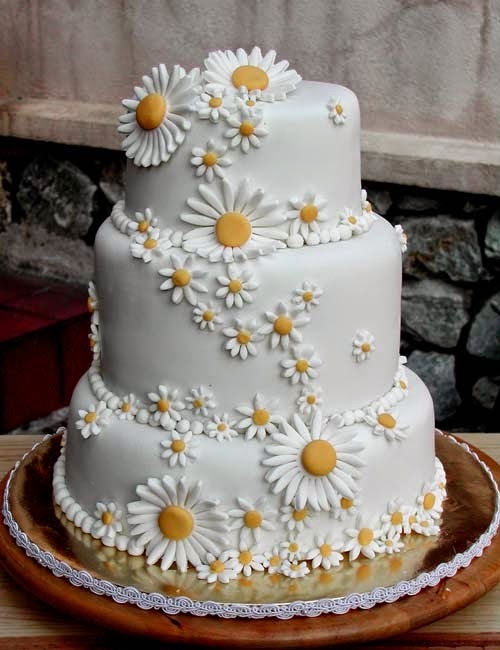 If you want this lovely theme applied to your cake then make sure to ask your caterer or florist to show you pictures of how they have used the Gerbera daisy in their cakes. Choose any color and adorn with other flowers and decorations for a masterpiece you will remember for many years to come. One final word about the delightful flower called the Gerbera daisy, these blooms are so beautiful and eye popping that they steal the show so arrange them carefully. Your bridesmaids can wear them in their hair and they make striking boutonnieres for your groomsmen. Have fun when you are decorating and remember it's a task you will adore.